The CompTIA Server+ credential is one of the most widely established computing qualifications. A credential acknowledged by both public and private sector establishments. CompTIA Server+ Certification certifies the competency of network administrators working in the IT industry. In today's computer industry, it isn't enough to know an operating system to be a system administrator. The skills and knowledge measured by the Server+ 2005 exam are derived from an industry-wide and worldwide job task analysis and a survey to validate the job task analysis. The survey results were used to weight the test domains and ensure the weightings are representative of the job requirements. Are you ready to showcase your advanced IT skills including experience working with ISSA (Industry Standard Server Architecture) technology, RAID, SCSI and multiple CPUs, disaster recovery, and other vital server issues? If so, CompTIA's Server+ is the credential to prove your advanced IT abilities.Not only do domestic employers value this credential, but international employers as well. In fact, many corporations around the world now require CompTIA Server+ certification of their IT staff members because it validates basic server support abilities. Because of this, it's important to your career to earn the credentials that prove your skills. That's where Server+ training comes into play. You may already have the existing skills (or think you do) but passing the certification exam is another thing altogether. This format is exceptional because it blends the best of technology, including interactivity and simulations, as well as the best of personal instruction. The computer based disc features full motion video segments of classroom training sessions led by the experts. 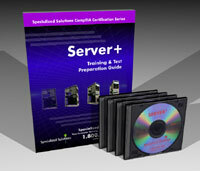 CompTIA Server+ Certification is internationally recognized by many corporations. Indeed, CompTIA Server+ Certification is a prerequisite qualification for employment (and is endorsed) by many leading computer manufacturers and vendors on a global basis. Broad. Service managers, service technicians, systems engineers/administrators, help desk staff, system analysts and network analysts and architects. 1.11 Know the characteristics of hot swap drives and hot plug boards. 1.12 Know the features, advantages, and disadvantages of multiprocessing. 1.13 Know the attributes, purpose, function, and advantages of clustering. 3.09 Implement the server management plan (OS-dependent and OS-independent components). 5.05 Monitor, maintain, and follow the server management and service plan. 7.02 Use diagnostic hardware and software tools and utilities. 8.01 Read and follow the disaster recovery plan.